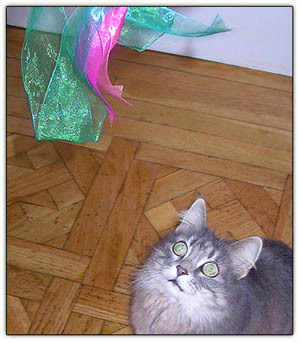 A leftover bit of Xmas ribbon catches Tiny's eye, a teaser for the feral predator within. Head on over to Rand's for "Muhammad on a bad turban day" and other punctuational blasphemies. 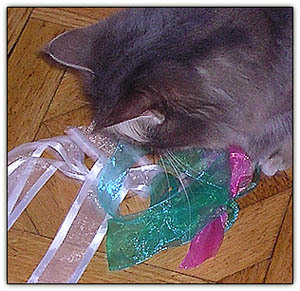 Going her usual route -- for the jugular -- Tiny bags the ribbon. As with mice and other small mammals and birds -- not to mention superballs -- once they're caught and stop moving, she quickly loses interest. Once an Islamist catches someone blaspheming and reduces him to Dhimmitude, does he, like Tiny, lose interest? Update: Tiny is featured in Laurence Simon's topical "Let's ask the cats." In answer to "What does PBUH stand for?" she replies "Purr box up high." You're so right, Laurence. As Tiny was just saying, Purr Box up High fits a multitude of situations.